When Jenny grew to adulthood, she continued working with children in several other In Home Daycares and also as a nanny for several years. Since Jenny has had her own three children, she has decided to stay home and put all of her time and focus into her own family. 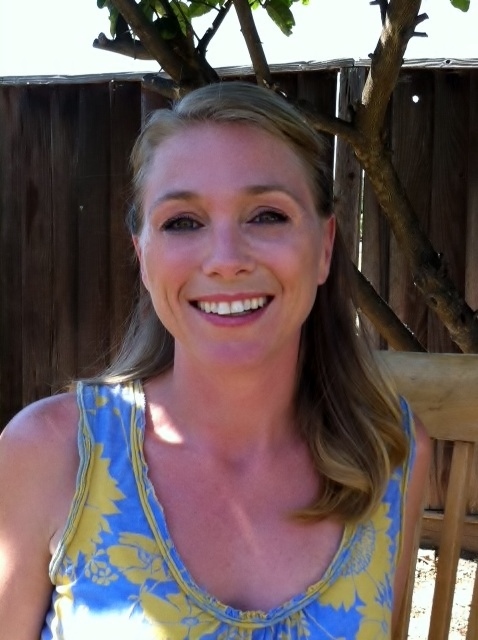 Author Jenny Loveless currently lives in California with her husband, three daughters, her cat Chedder and her fish named Rocky. Jenny Loveless enjoys what she does as a homemaker, however she misses the opportunity to be a part of the development of other children. To continue to be of service to others, Jenny has gone on to write four inspirational children's books, all with valuable life lessons to help inspire children to believe in themselves, and their dreams. Jenny has several dreams of her own on her list of goals. One, is to do influential seminars in high schools and teach students to continue believing in their goals, and use perseverance to achieve them. Jenny would also like to someday donate $100,000 or more to public schools and libraries, and be awarded a Pulitzer Prize. She firmly believes that focus, perseverance, and belief in ones self and their dreams can accomplish anything. Good luck Jenny, we hope to see you win the next Pulitzer Prize! Have you been looking for tips on building your child's self esteem just to find the same tips over and over again? Well Look no further. I have found fifty of the best expert tips and consolidated them all for you right here in this book! Fifty Tips on Raising Your Child's Self Esteem is a fabulous easy to read guide with great tips from experts on children. It has a funny sarcastic twist from a mom's point of view, who at times feels she is going to lose her mind herself. This book has great explanations for each tip and many examples to try as well. Not to mention, there is fifty of them. If you don't like one of the tips, you have forty nine more to choose from. There are many parenting books on this subject, but how many of them are written honestly, by real parents? The tips in those books are all true, but they make you feel as though you're sitting in a therapist's office and he is telling you everything you're doing wrong! Finding these tips can be very time consuming. Let's cut to the chase. Instead of spending all your time searching, spend your time putting the tips into action. I have searched tons of websites and blogs from child psychologists, teachers, therapists, daycare providers, doctors and other professionals. I have stolen their tips and consolidated them into this quick, easy to read guide to help raise your child's confidence. I have three girls, and I can tell you that raising children is tough. But whether you are raising girls or raising boys, potty training or teens, the information in this book can work for your child. I was learning as well, while I was writing this book. I have already implemented many of these tips myself and have seen success. If your child already has low self esteem, implementing the tips in this book will help to raise your child's self image in no time. If your child already has great confidence, well then this book will simply give you an extra boost. Follow the examples, and if something doesn't work for your child, move on and focus on another. Raising a child is tough. That's why this is only one, of many child development books you should read. If you want to know how children succeed, it's through happiness. It's the beginning step into their future. This quick guide and book on parenting is filled with fifty tips and more to start boosting your child's confidence, and get him on the road to success. It's a fast easy read that will help you start putting these tips into action today! Have you ever read an ebook to your child to find that many pages don't have a picture? Ducky Duck has one on every page. Hold your kindle vertically for this feature. 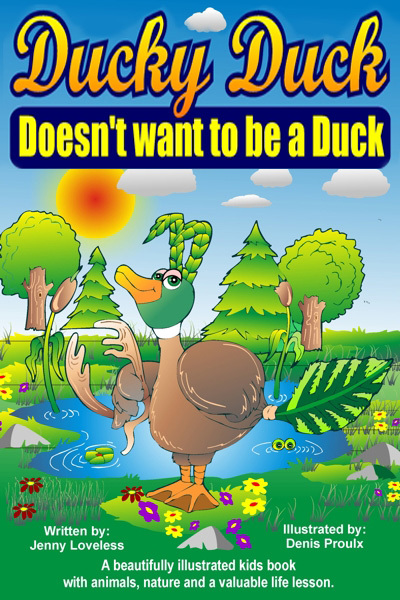 Ducky Duck Doesn't Want to be a Duck by Jenny Loveless is about a duck who wants to be anything else but a duck. Together with his friends, Ducky goes through different identities in a humorous little adventure. What an excellent book for children. I read it with my 6-year-old niece and 8-year-old nephew. They both love the fact that there are colorful, big pictures on each page and that the texts are just the right amount with just the right size. The prose is straightforward and easy for the kids to read or learn to read. In fact, my lovely niece requested that I include this book as one of her regular bedtime stories. Behind this funny, colorful, and imaginative story is an imperative and deep message for the children: learn to love and accept yourself. Brilliant work from author Jenny Loveless. She definitely knows how to write for children and make them love her stories. I am happy to recommend this book to any parents who want to make sure that their children are entertained and educated at the same time. I am going to check out Jenny Loveless' other works and I am planning to make her books as the primary fun-learning source for the children. Excerpt: "Mama, I want to be a bunny. Bunnies have a lot of fun, so now I'm going to be a bunny." Excerpt: If Ducky were going to be a beaver, he would have to look like one too. So Ducky found a branch from a pine tree and made his very own beaver tail out of it. Then Ducky went to find his friend Beavis Beaver. Ducky Duck Doesn't Want to be a Duck is a super funny picture book for your little one, and it has fun repetitive, catchy text which makes it the perfect book for your beginning reader. Have you ever read a kindle book to your child to find that many of the pages don't have a picture? Author Jenny Loveless also has children that she reads kindle books to, so she understands how little minds work. Children like books with pictures....lots of pictures. This illustrated children's book has them. Jenny has made sure to add each illustration an additional time so that when you go to the next page, the picture is still there for your child. Are you looking for an amazing children's book that you will love just as much as your child does? Are you looking for great writing and beautiful pictures on every page? You have found that right here with Holly Horse and the Great Quest! "Oh my gosh, that was so good, the end made me cry. What a beautiful story." --Marisol Morales. Is the grass really greener on the other side? Holly Horse thinks it is and she is setting out on a journey to find it. 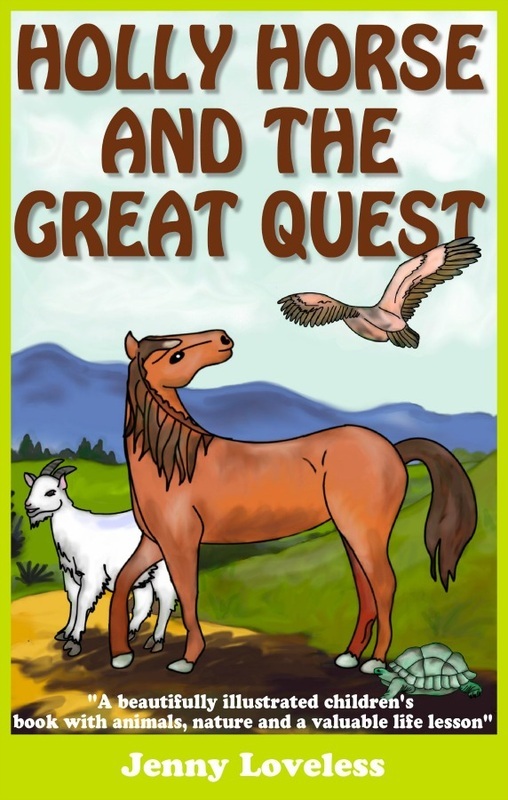 In this exciting kid's book, Holly Horse meets many new friends on her quest for the greenest, most delectable grass. An old goat, a silly rhyming owl, and a 72 year old tortoise named Mr. Tim Tortoise, aid Holly in learning one of life's most fundamental lessons. The beautiful message behind the story is meant for both young children, and adults. The end is so powerful, that if you are an adult, it may even bring a happy tear to your eye. Jenny Loveless has collaborated together a collection of children's books for kindlefire, that all include a valuable life lesson. These picture books are humorous and entertaining. Jenny too, has children that she reads kindle books to, so she understands how little minds work. Books for kids should have pictures..... .. lots of pictures. The author has made sure to add many illustrations for your child's enjoyment.